Subscribe to our newsletter to get the latest news and updates about Cat + Fish Dances. Cat + Fish Dances is a project-based dance company located in Salt Lake City. Founded in 2015 under the direction of Cat Kamrath, Cat + Fish Dances has performed their works at the University of Utah, Utah Museum of Fine Arts, the Great Salt Lake Fringe Festival, and the Rocky Mountain Choreography Festival. Cat + Fish Dances is a RAW Artist. 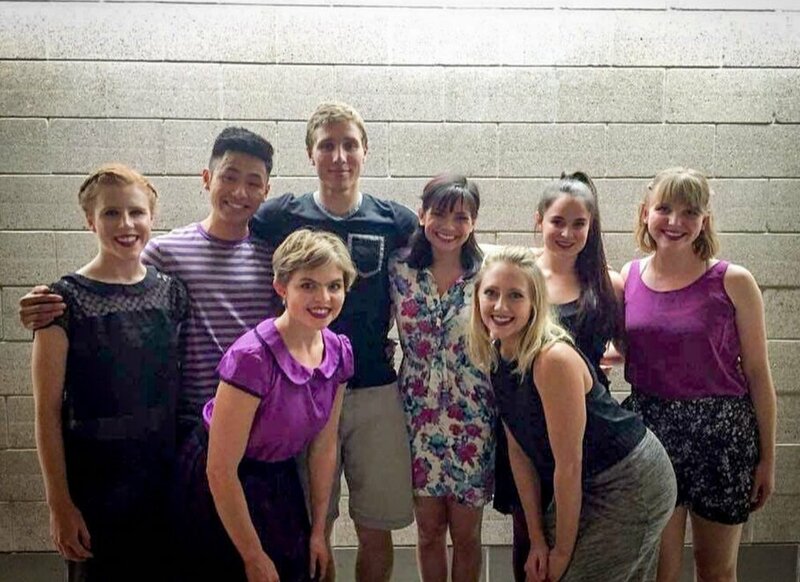 Current company members: Kenzie Allred Sharette, Micah Burkhardt, Daniel Do (founding member), Conner Erickson, Madaline Maravillas, Megan O'Brien, Emma Sargent and Alicia Trump. Former company members: Madeline Andersen (founding member), Marty Buhler (founding member), Tori Jane Duhaime (founding member), Dan Higgins, Luciana Johnson (founding member), and Roxie Lebenzon. Flicker focuses on life’s unsteady nature as seven dancers explore connections with their peers through an evening of dance. Each dancer has a different journey of physical, synchronous, and missed connections. The movement changes in quality, tempo, and location, serving as a reflection of humanity’s ability to fold, fall, and flee. Furrow investigates the means of folding and unfolding. Questioning how we fold into and out of ourselves and our community, this ten-minute work was built specifically for the RAW showcase. Filament, the second installment in Cat + Fish Dances' Fibers series, investigates the relationship between movement and inhabited environments. Four dancers explore how their individuality can thread into a community. Over the course of four shows, we had audiences from the Salt Lake area and out-of-state participants of the festival. Review: Filament was featured in a review by loveDANCEmore. Check it out here. Created in fulfillment of the Modern Dance MFA degree, Fibers is the product of creative research involving the relationship between the human body and space. Combining architectural principles with Rudolf Laban's Space Harmony Theory, seventeen threads weave together to create this 17-minute work. Created through the lens of Laban/Bartenieff Movement Analysis, Swims Our Blood explores Body, Effort, Shape, and Space theories and their relationship to choreographic methods, personal movement style, and collaboration.